I’m a little under the weather over here, so this post is coming to you later than usual! Over the last few months I’ve had the pleasure of working with Oksana and Dawn of As Sweet As It Gets Events on their new website. They are both so talented, and I’m so pleased to share what we came up with! They came to me with beautiful branding by Uniquity Design, which meant I got to focus on how to best display their gorgeous work! These ladies were so much fun to work with! Head over to the site and check it out for yourself, I’m especially fond of the Reviews & Press page! Congrats on the launch! The site looks great! 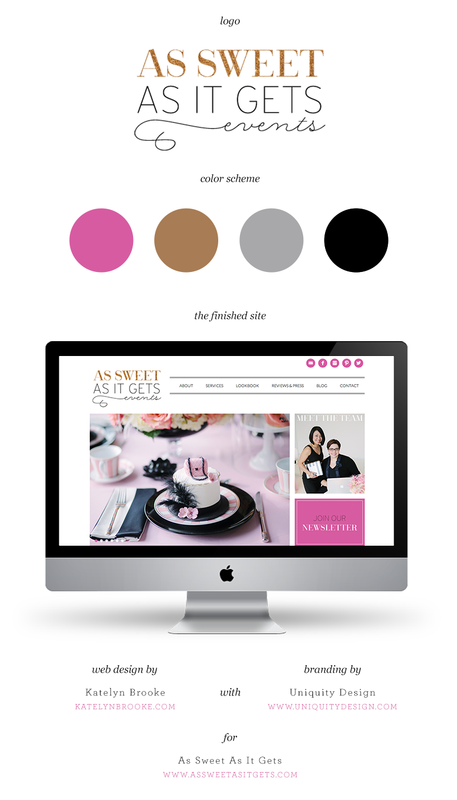 Loving the colors they picked for the branding and how you incorporated them into the site design. Thanks Angel, it was fun to have such a great starting point! congrats on the launch, kate! I love the logo! My favorite part is the swirl from events. great work! Thanks Kercia! Isn’t that pretty? It’s so nice when the client comes to you with a beautiful logo all ready to go! I agree with Angel – I love how you took their colors and brought everything together so nicely! Great work as usual, Kate! Beautiful! Love the wide sidebar and minimalist home page. And the clean lines – it’s a treat for the eyes! Really lovely design Kate, great job and I too love the colors, very unexpected! It looks great! The reviews and press page is pretty awesome!